Helps to reduce the risk of minor collision accidents during traffic congestion on expressways, contributes to reducing the burden on drivers. 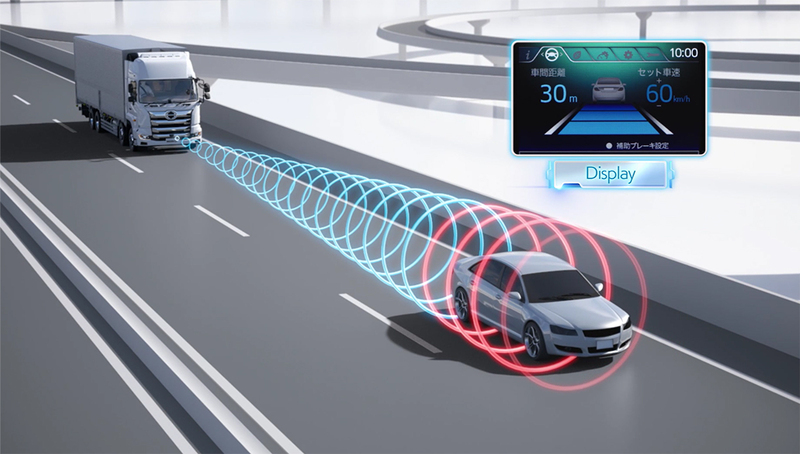 Uses millimeter-wave radar (which is good at detecting distances and less likely to be influenced by weather) to detect the vehicle ahead and automatically maintain distance between the vehicles. When the vehicle ahead decelerates or stops, the equipped vehicle also stops completely. As soon as the vehicle ahead moves again, the equipped vehicle starts following again. 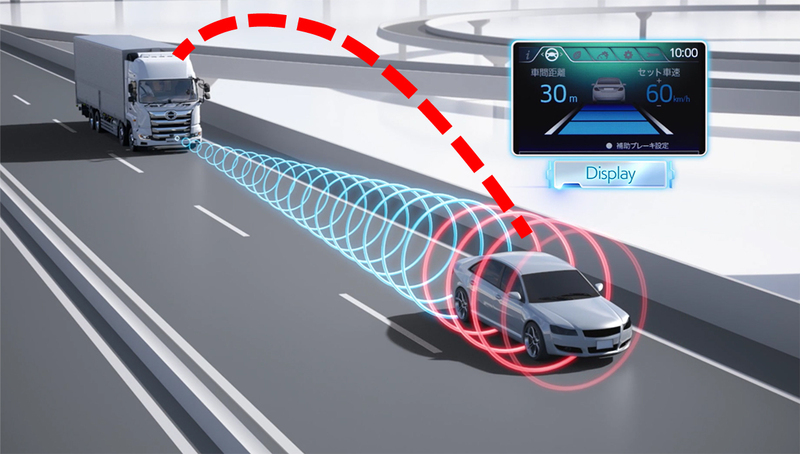 In addition to maintaining distance between vehicles using millimeter-wave radar, the vehicle communicates with the vehicle ahead to receive acceleration/deceleration information.Based on this data, the vehicle controls its own acceleration/deceleration and more steadily maintains the distance between the vehicles. Contribute to prevents accidents caused by lane departure on expressways, contributes to reducing the burden on drivers. Supports safe in-lane driving, using a camera to recognize white road lines and operating the steering wheel to aim for the center of the lane. Offers support across the entire speed range of the vehicle. Controls the steering wheel based on GPS information so that it follows the route map expressed in latitude and longitude. Identifying own vehicle/surrounding environment Contributing to measures against accidental contacts with vehicles, pedestrians, etc. Detect the vehicle’s surrounding environment using cameras or sensors, and warns the driver to take care when there is danger of contact. Measures for accidents caused by driver health conditions. 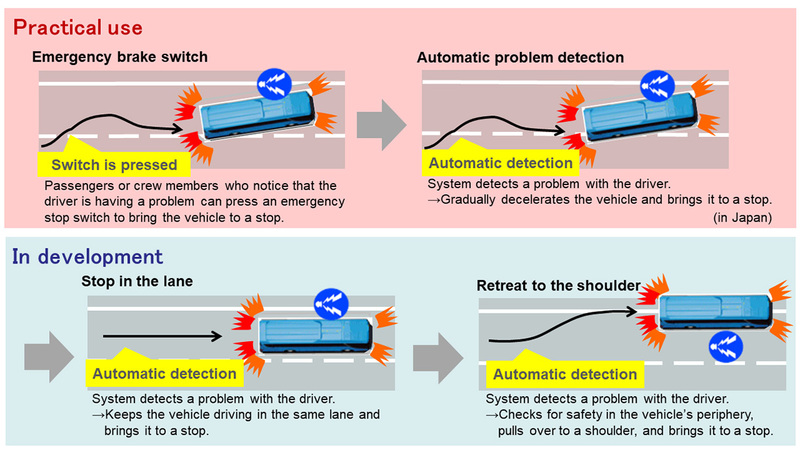 As a technology contributing to measures against accidents caused by driver health conditions, this system brings the vehicle to a stop if the driver is having difficulty in continuing to drive due to a sudden health problem, etc.We plan to put the developed technology into practical use in a gradual fashion, and promptly introduce it to the market.